Have you tried pita chips lately? I swear, they sounded healthy, so I tried several brands and gave up because they were all no bueno. 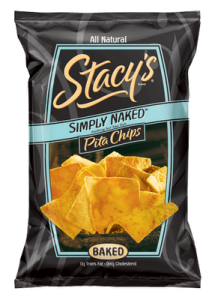 Stacy's Pita Chips then entered my life on a date when desperation hit me. And I LOVE them. Add some cilantro jalapeno hummus or Laughing Cow and I'm in heaven. Seriously. They have cinnamon, parmesan garlic, multi-grain, veggie medley and simply naked. Wouldn't you suspect that my favorite is the simply naked? Cause it is. Yum yum. I buy theses every time I fly because they keep me full and help me not to get nauseous. I love them.